We will create a New Ministry of Information. It shall consist of the former board of directors of Cambridge Analytica. They already know everything. We will Send Noel Edmonds to negotiate Brexit because he understands Deal or No Deal. There will be no need for a backstop to the Brexit negotiations. We’ll have Alec Stewart as wicket-keeper. There will be a round of local elections in various places around Great Britain on Thursday 2nd May. If you are considering standing on behalf of the ‘Raving Loony Party’ remember you can’t just do it, you have to get permission from the party with relevant papers. Nomination papers must be returned on or before 4th April. I shall not be here to endorse you as I shall be in Malta all through March. Nick Delves, The Flying Brick is to be my acting Nomination Officer in my absence. His no is 07973 324985, he will talk you through and help with anything that your not sure of. Nominating Officer and Party Leader. After much speculation and arranging to have this years conference down South, and not coming up with the right answers, we have decided to go back to Belper in Derbyshire once more. With the kind permission of Craig the landlord of the George and Dragon, the scene of last years ‘Belter in Belper’. Those of you that were there, will remember how great it was, and how wonderful the people were. Lets see if we can top that this year, I expect we can, or have a good laugh trying. No definite entertainment has been fixed as yet, only the dates Thurs 26-27-28th September, although once again I shall be there as from Thurs 19th, so if you want to make a week of it, you won’t be on your own. So don’t leave booking yourself in to late, as some did last year, there is plenty of accommodation around if you book early. More info as it unfolds. I’m off to Malta now until 1st April, so will be in touch again on my return. ‘Dr Diablo and the Rodent show’. If you’re near Blackpool on Saturday you should go and see them . . .
An error in the 2018 conference write up in the Wetherspoon Magazine. The article states I produced the 99p coin, when in fact it was Tony Blythe, the Jersey Flyer, our party chairman that minted these coins out in Jersey. He handed me one when I started talking about them, so it appeared I already had one. The fact that the 99p coin idea went down so well, was because of his quick thinking. Thank you Tony. New Party Headquarters in Lanzarote. We now have a new party Headquarters, it is not the Bulldog Bar in Costa Tequise anymore. The Landlord ‘Tigger the Loon’ has taken up residence in Playa Honda at the El Bereber Bar that was, address – Calle Guanarame 57. It has taken on a new name, it’s now called ‘Tiggers Sports Bar’. 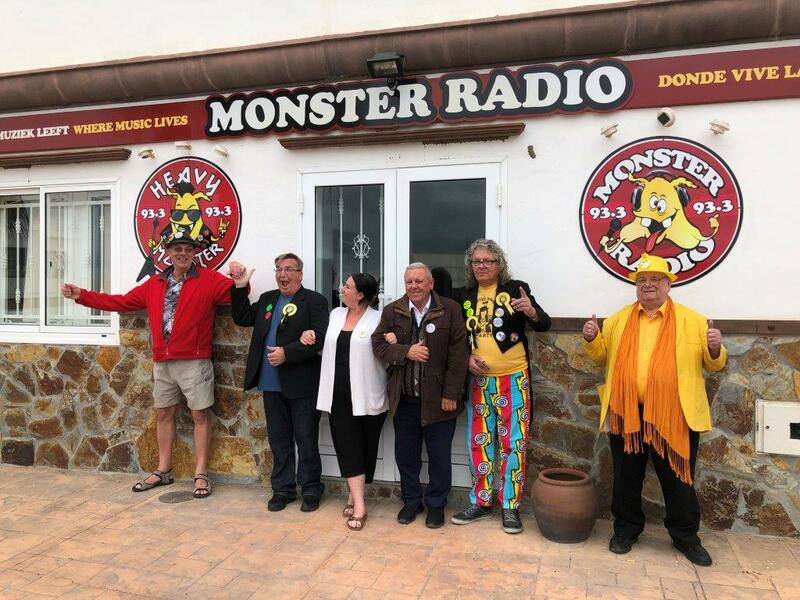 A very handy location because its right next door to the ‘Monster Radio Station’ where you can sit in the sunshine, and meet all the Spanish/ Lanzarote TV and Radio Stars. I was over there for three weeks early January, officiating the new Party HQ move. Lawd Lawson and O B Joyful flew over for a week to attend the grand opening, and a grand time was had by all. Special thanks to Ri Dickulous Knowles and Tigger for arranging such an auspicious event, all the bar staff, and the happy bunch of locals that welcomed us with great excitement! News of Party Conference 2019 to follow very soon . . . The Official Monster Raving Loony Party are applying for an HM Government ferry service contract. Given we currently have two more vessels than Seaborne Freight, we expect the contract being awarded to us will be a mere formality.